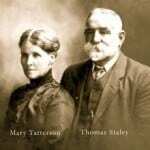 Click this link to visit the family history/genealogy database of Thomas Staley (1769-1851) and his descendants to this very day. This is the story of many people who are the descendants of, or have married into the Staley Family which originally arrived in Victoria, Australia from 1848 to 1853. They were born in Scotland but the originator of this line, Thomas (born abt 1769) was actually born in Co. Durham, England. The stories for our families begin with Jonathan Staley born in Glasgow 9 July, 1794, the fourth of five children of Thomas Staley and Mary (nee Ritchie). Jonathan was an Iron Miner like his father. He married Mary Goldie in Muirkirk, on 30 June, 1820 and together they had twelve children, three of them are believed to have died before adulthood. One child, Jonathan, went with his family to America in 1849 and his family tree grew there, whilst eight migrated to Victoria. Mary was to become a widow, for Jonathan died 27 February 1847 in Scotland, not too long after that time, our forebears were to begin their long journeys to our shores. The first to depart was the eldest child Agnes with husband Daniel Blyth and two children John (9) and Elizabeth (3), they came as assisted immigrants on the “Tasman” of 567 tons, it sailed from Plymouth on 15 June, 1848 arriving at Port Phillip, 18 October 1848, they may have gone to Geelong, but were to spend their lives in Brunswick. A few years are to pass before the next departure which was on the 914 ton “Cambodia”, which sailed from London on 4 December, 1851 carrying 313 emigrants, amongst whom, was the widow Mary aged 51 and her 4 unmarried children, Allan 23, David 19, Margaret 17 and John 11. They arrived at Geelong 31 March 1852, also on board was Mary’s fourth child, Mary, her husband Robert Hamilton and their three children, Robert 6, Jonathan 4 and Mary 2, another son, Thomas Cambodia was born on the voyage out. The year 1852 saw another departure, that of the fifth child Robert and his wife Jane Gillies, with their two children, Elizabeth 1, and baby Jonathan, they sailed from Liverpool on the “Bourneuf” a ship of 1495 tons, it left on May 26 arriving at Geelong on 3 September 1852, this was an horrific voyage and many children died. The last to arrive was the second child Thomas along with his wife Elizabeth Hamilton, their five children, Jonathan 10, Mary 7, Elizabeth 5, Jane 3, Robert 2 and stepdaughter Agnes Wilson 13, they sailed from Glasgow on 8 March, 1853 aboard the “Reaper” of 424 tons and arrived 148 days later on 23 August 1853 at Port Phillip, Melbourne. The first branches of the family tree are now in Victoria and history unfolds as these families go about their daily lives. The widow Mary is listed in the 1851 Scottish Census, her profession being Tambourer (embroiderer) as was her daughter Margaret, Allan and David were listed as Iron Miners and John was a scholar. The passenger list of the “Cambodia” has Mary as a housekeeper, Margaret as a General servant with Allan and David, being agricultural labourers, Mary was to be employed by a Mr. Radmidge of Corio Street, the last we know of Mary was her death in the home of her daughter Margaret at Kensington (Leopold) in the Geelong area on 27 December, 1854, caused by “bilious fever”, the informant who signed the Death Certificate was her son-in-law Daniel Blyth. Mary was buried in Geelong Eastern Cemetery. There is very little recorded about Agnes Blyth, we know that several of her nephews and nieces were born in Brunswick, possibly at the Blyth or Staley residences, maybe whilst their fathers’ remained in the goldfields. Agnes also had her third child Mary, in Brunswick, reading between the lines, it appears that the Blyth’s and the Brunswick Staley’s had been very accommodating to the rest of the family, Agnes died in 1882 at Brunswick aged 62, both the names Agnes and Blyth are used often for Staley descendants, perhaps a tribute to the esteem in which they were held. Brunswick history records, early residence by Daniel who was listed as a miner on the “Tasman” passenger list, he arrived prior to the Gold Rush and it is known from a report of an armed robbery at the Blyth home, from the Melbourne Argus in June 1852, that he was at the Mount Alexander Diggings (Castlemaine Area), he was well known and respected in Brunswick, early on he was a Grocer, his shop may have been well patronized by those on their way to the diggings, he owned several Brunswick properties, Blyth Street was named after him and he owned land and a shop there, at the time of his death in 1887 aged 70 he lived in Sydney Road, Brunswick. The Blyth boys both went to New Zealand, Jonathan and his family remained there. Thomas and Elizabeth, having arrived in Port Phillip in August, 1853 probably took their family straight to the Mt. Alexander diggings around Castlemaine, their youngest child Robert, died there later that year, Elizabeth was in Brunswick for the birth of her twins Robert and Thomas late in 1854, another 2 children, Margaret born 1856 and Jonathan 1862 were both born in Castlemaine. Thomas Sr. who was a gold miner died in 1878 aged 56 at Lady Gully, Castlemaine, he and Elizabeth are buried in Castlemaine Cemetery at Campbell’s Creek. Mary, wife of Robert Hamilton did not enjoy a long life in her new land, she had a great deal of sadness in her short life, her first two children had not survived in Scotland, her mother died in 1854 and in the short time before her own death in 1856, Mary gave birth to two more children, John, born in Brunswick and Agnes, born at Forest Creek (Castlemaine), which was the place where Mary died on the March 2, Robert Hamilton remarried on 16 June 1857 to Sarah Thomson at Brunswick. Robert Staley and wife Jane spent most of their married lives in the goldfields of Victoria, their third child Mary was born in Brunswick, they were in the Castlemaine area for several years where another three children were born, about 1864 they settled in Inglewood where the last four children were born, three of their offspring died as young children, Robert was a miner and he died in Inglewood on 19 July, 1882 aged 56, Jane lived to 83 years and died on 25 February, 1912 by which time eight of her ten children had predeceased her. This family had well over a century of history in Inglewood and is a strong branch of our family tree. Allan Staley, who came out on the “Cambodia” in 1852 was thought to be in the Castlemaine area around 1856, he married Janet “Jessie” Brown Dods in Brunswick in 1857, Jessie like Thomas Cambodia Hamilton, was born at sea. Allan had a close association with Daniel Blyth, they owned some properties together in Brunswick, Allan was a Councillor 1868-70 and 1872-82 and Mayor of Brunswick 1872-3 and 1876-77, he also stood unsuccessfully for a seat in the State Legislative Assembly in 1868, he was also a Justice of the Peace and sat on the bench in the Magistrates Court, he was also the first Licensee of the Court House Hotel in Sydney Road in 1858. He prospered in Brunswick, Staley Street (off Blyth St.) was named after him, he died in 1884, aged 55, it is known that Allan’s Estate was distributing money to the families of his late siblings in Australia and the USA as late as 1906, by then the properties had been sold. Allan and Jessie did not have any children, Jessie remarried in 1888 to William Elder. David Staley was also in the goldfields of Central Victoria, he married Agnes Leishman in 1855, they had eight children, two of whom died in infancy, by 1865 they had settled in Yandoit (between Castlemaine and Daylesford) where David had a store and property, he died in Yandoit on 24 February 1881 aged 48, he is buried at Vaughan Cemetery. Agnes died in 1877 aged 41. Margaret Staley married the gold seeking ex medical student, Thomas Law McMillan in 1854, they met and married at the Blyth home in Brunswick, Thomas set up practise at Kensington (Leopold) near Geelong, they were there for a year before going to Edinburgh, they had four daughters, two of whom were born in Scotland as Thomas gained his medical qualifications, they lived in Kyneton, Victoria, eventually settling in Melbourne, Thomas became President of the Medical Society of Victoria in 1878, he was much travelled, he died in East Malvern in 1892 and Margaret died in 1881 at South Melbourne. A line of this family also continues in New Zealand through her daughter Edith Agnes. John Staley was only 11 years when he came to Victoria, his mother died less than two years later, it is not known where and by whom he was raised, he was a miner, before and during his early married years, he used the name John Goldie to marry his niece Elizabeth Staley in December, 1871 at Castlemaine, they had five children, four girls and one boy, the youngest a girl named Jessie, was only 6 months old when John passed away with “chronic pneumonia” at their home in Stewart Street, Sandhurst (Bendigo). The family was in dire straits at the time of John’s passing, he was held in high esteem and a Benefit Concert was arranged to assist Elizabeth. This is the story of the migrant generation, there is much more to know about them and the succeeding generations. Can you help? If so write it down or record it – please do, so those that follow will know something of their history, maybe you would like to have something included on this site. I would like to thank the late Tom Staley, who started me on the path of Genealogical addiction, many years ago, and also Peter Duddy for his good work on this Site.